I am a seriously cold person. Wherever we go, it seems I am always the only one freezing while everyone else is sweating up a storm. I sit each week in my Ward’s nursery with my daughter and end up stealing every doll blanket available to cover my shivering body while everyone else is disgruntledly suffering through the apparent firey furnace that rages through the room. I guess the AC doesn’t work, which is disastrous to everyone else but me. I try to hide my smile(with little success) whenever the broken AC is mentioned. My point to all of this, I guess, is that I am the last person in the world to want a cold drink unless the weather is really, really warm. And guys? It is! Summer has finally come knocking around these parts and it’s all I can do to stop myself from making these frozen lemonades every day. 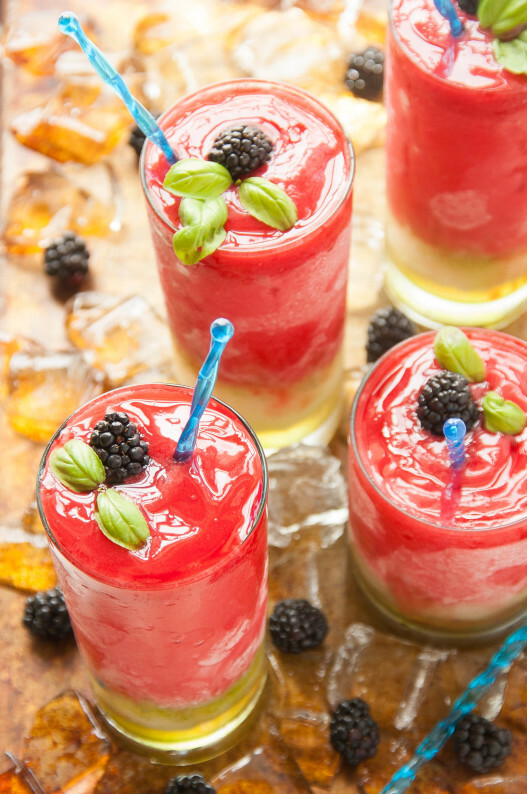 These frozen lemonades are made with fresh, plump blackberries and a tangy lemonade base made from fresh lemons. I top it all off with a little fresh basil syrup. 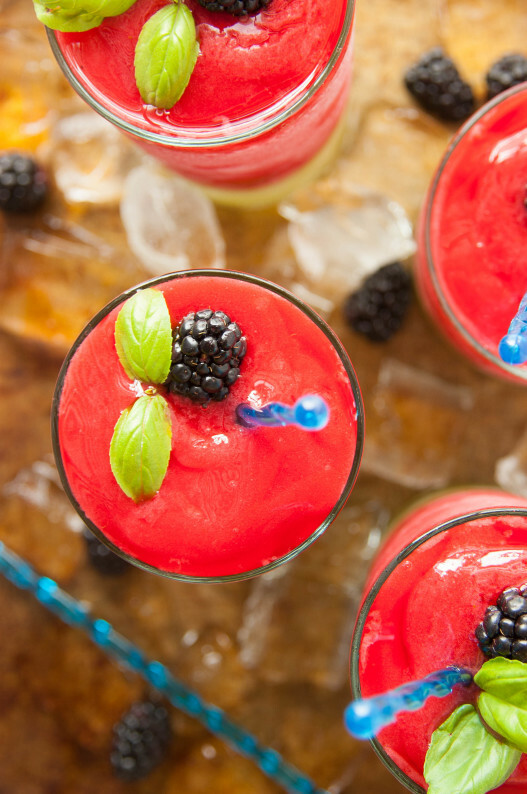 Basil and blackberries go together like a dream and the colors are so bright and pretty. 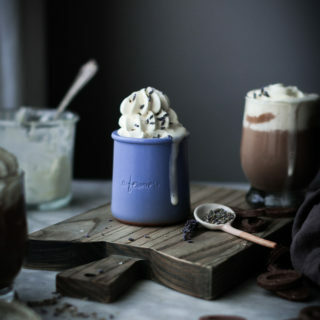 I love to keep the syrups and lemonade bases stocked up in the fridge so that I can blend one of these up at anytime. High speed blenders are great for making frozen lemonades that are totally smooth and ice-chunk free. I use a vitamix and it gives the most perfect results. If you want to get a bit complicated(my favorite way to be)and make the lemonades layered exactly like the pictures show, blend a batch of lemonade with just the lemonade base first, scoop out a little into a glass and drizzle the basil syrup over that. 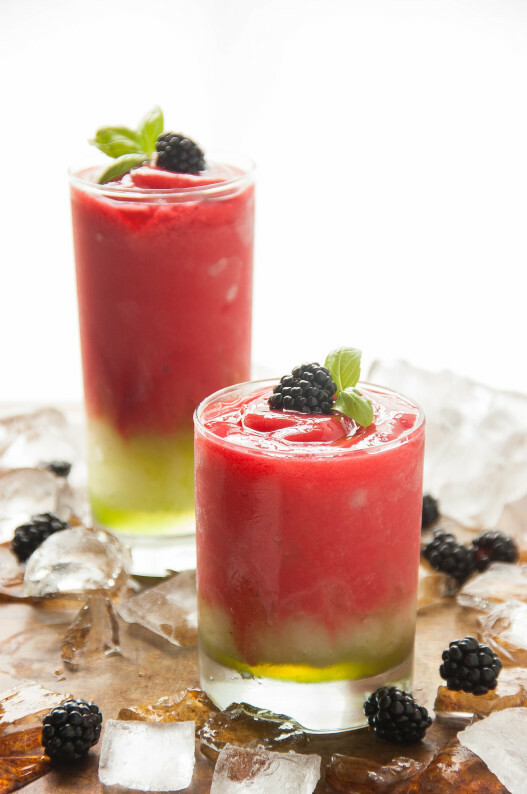 Then add the blackberry puree into the rest of the frozen lemonade in the blender and blend together. 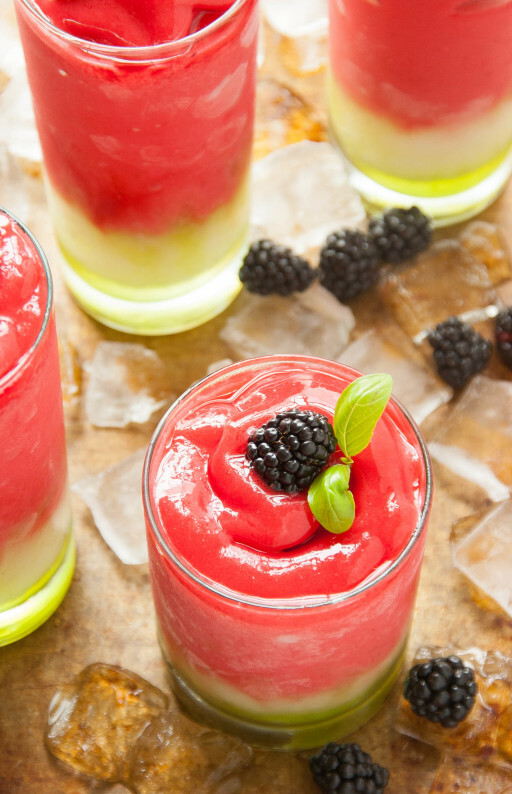 Scoop the blackberry lemonade on top of the basil soaked version and top with a fresh blackberry and basil leaf. Enjoy! Thirsty for more? 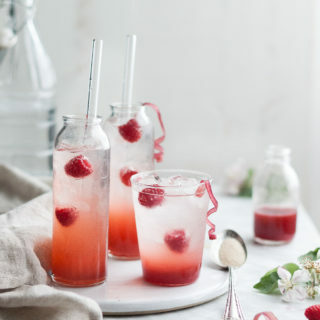 Try out THIS drink for one of the best summer refreshers out there! Like things a bit fizzy? THIS has your name on it! Place ½ C. Sugar and ½ C. water in a small saucepan. Bring to a boil over high heat. Reduce to medium heat and let simmer for 1 minute. Remove from heat and allow to cool for about 20 minutes. When the syrup is no longer hot, place it in a blender or food processor with the fresh basil leaves and puree for 1-2 minutes, scraping down the sides with a rubber spatula, if needed. Mixture should be bright green and smooth, no chunks of basil should remain. Place basil syrup in a airtight container and refrigerate. Place the blackberries, 1 C. Sugar, and 1 C. water in a saucepan and bring to a boil over high heat. Reduce the heat to medium and simmer for 10 minutes, stirring occasionally. 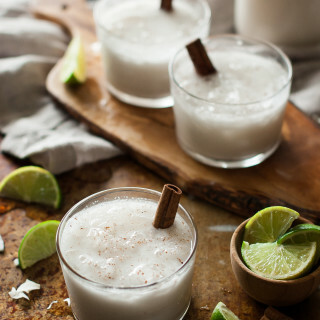 Place the mixture in a blender or food processor and puree until smooth. Put the puree through a small mesh sieve, and discard the seeds. Refrigerate the remaining puree in an airtight container. Place the lemon juice, 1 C. Sugar, and 1 C. water in a saucepan and bring just to a boil. Remove from heat and place in an airtight container. Refrigerate. Place about 14 ice cubes in a blender. Add ¼ C. lemonade base, ¼ C. water. and ⅓ C. blackberry puree to the blender and blend together until the ice becomes very fine and smooth. You'll want to check the taste of the lemonade and add more lemonade base, water, or blackberry puree as you see fit. 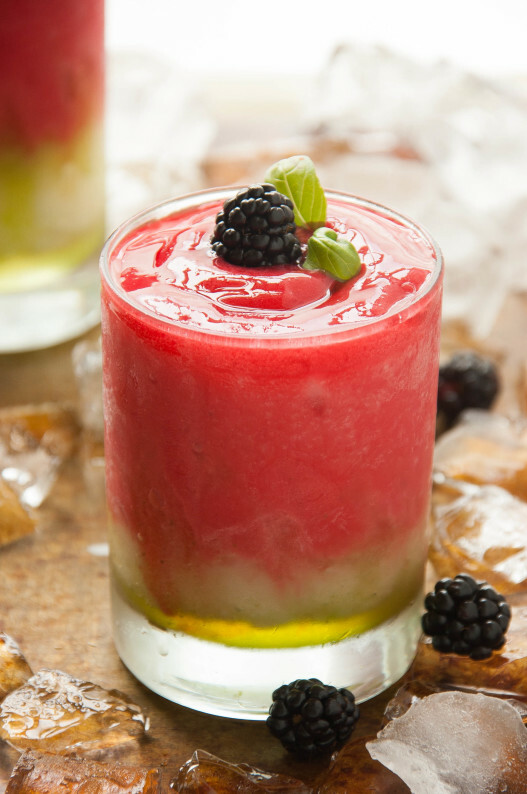 To serve, scoop about ¼ C. of the frozen lemonade into a glass and drizzle about 1 T. of the basil syrup over the top. 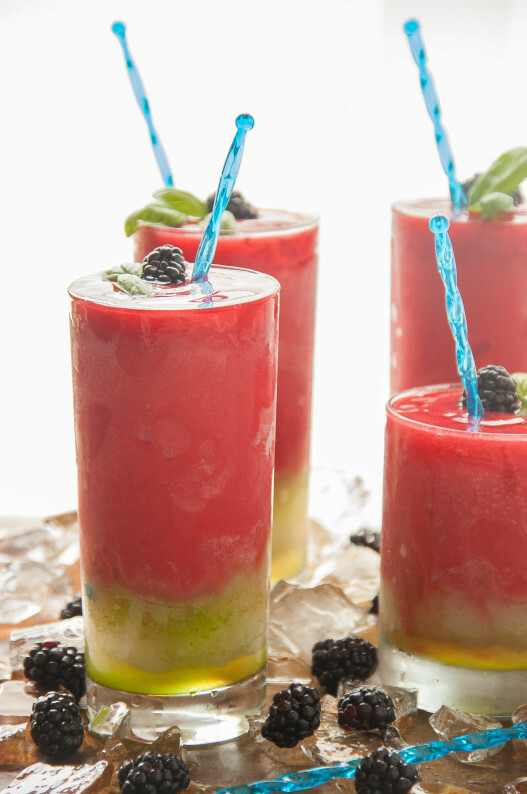 Fill the rest of the glass up with the frozen lemonade. Garnish with blackberries and basil, if desired.